Ok so it was never a terribly funny remark but it wasn’t meant to be I don’t think. It was just meant to point out a truth and my gosh does it ever: Old Dave and I wandered in the wilderness for years in our marriage, ‘assuming’ we knew what the other one was thinking. Or worse, assuming judgment when there was no judgment intended, as when I’d darkly interpret a look at the supper table that probably just meant something he was chewing had gone down the wrong way. Just the other day I ‘assumed’ something about a little girl I saw at my gym. She was just emerging with her mom from the big glassed-in room where the childcare takes place, making her way toward the bathroom. She had on a sweatsuit with a princess dress over it. I beamed at her the way all grownups beam at little kids, admiring her sturdy and forthright manner; and smiling too at the thought that I go around dressed this way too some days, having dressed in a fog, earrings like chandeliers topping off an outfit you’d wear to shampoo the dog in. But this child was so CUTE! I went on in my mind, the way she had so clearly had wanted to wear that princess dress. It was a cold winter morning and her mother had probably said, “First we dress for the weather; then maybe we can we accessorize’” and the ‘accessory’ happened to be this pink tornado of spangled chiffon. I knew what was going on here! I knew what I was seeing! Didn’t my sister and I, playing in our red corduroy overalls, often affix our mother’s best linen tea towels to our heads to act as hair? Long, glamorous shoulder-length hair we could swing around while posing with one hand on our locks and one on our hips in the manner of Mae West? We were only five and seven but we knew all about that bombshell of an actress. And here was this tiny girl acting just like we had! Wasn’t she? Wasn’t she? No, in fact, as I learned when another smiling adult passed by. “She wouldn’t leave the house without her princess costume, eh?” said this fellow parent. And that showed ME! Assumption 100% wrong! 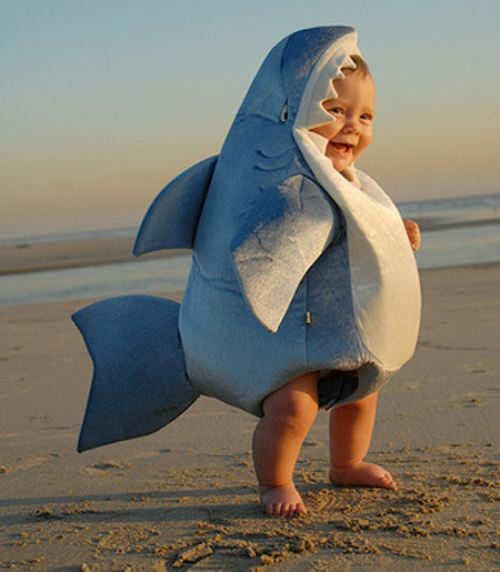 Just like that baby isn’t really a shark! Oy! Now let’s pause a moment and pay homage to that above-mentioned icon Mae West who made a whole career making thwarting people’s assumptions. Here she is playing the madame of a brothel, using her tough-girl purr to throw down the gauntlet before Cary Grant who, compared to her, sounds like a stiff and hopeless toff. Ah those fake-British accents the stars and starlets all used to affect! Everyone but Marilyn that is. Everyone but Mae.